For 25 years, the EcoFOCI has been conducting research within the Bering Sea, the subArctic connection between the North Pacific and the Arctic Oceans. From 1991 to 1995, Bering Sea FOCI research focused on management of the Walleye Pollock fishery, amassing data and developing hypotheses towards a baseline definition of the stock population and recruitment success. The follow-on SEBSCC program (SE Bering Sea Carrying Capacity, 1994-2004) created a collaboration between the FOCI groups and the Univ. of Alaska towards increased understanding of the ecosystem and study of the role of juvenile walleye pollock and factors that affect their survival. The BASIS program undertook an annual comprehensive survey of the Bering Sea epipelagic ecosystem on the southeastern shelf in 2002, which continues today. FOCI evolved into EcoFOCI, and numerous other initiatives have occurred to support these fisheries and ecosystem research efforts (Sheffield Guy, 2014), including the Inner Front Program, BEST-BSIERP and NPCREP funding. Our Bering Sea research efforts continue, bolstered by the mass of data resources we have accumulated over many years. Our Bering Sea research areas stretch from Alaska’s west coast to the dateline (180°). 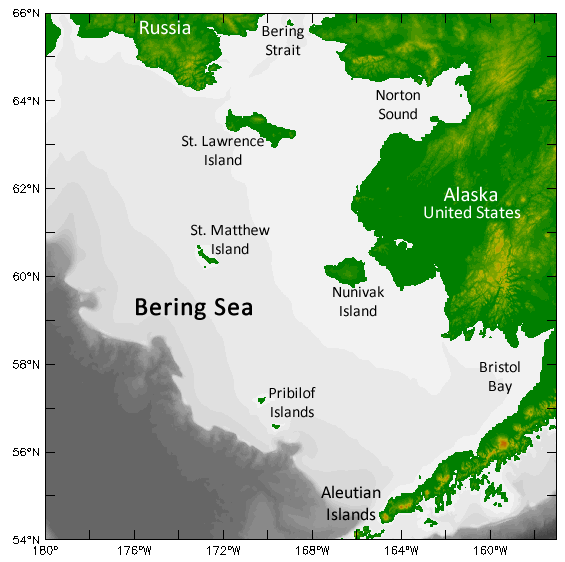 The Southeast Bering Sea Shelf was an early focus, which included the long-term mooring site M2. Work has extended northward as priorities shift, and as the ecosystem responds to long-term warming and decreasing seasonal sea ice. Sheffield Guy, L., J. Duffy-Anderson, A.C. Matarese, C.W. Mordy, J.M. Napp, and P.J. Stabeno (2014): Understanding climate control of fisheries recruitment in the eastern Bering Sea: Long-term measurements and process studies. Oceanography, 27(4), 90–103, doi: 10.5670/oceanog.2014.89.